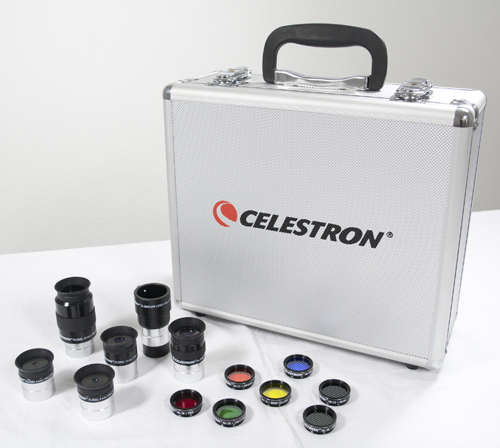 Celestron Eyeopener Eyepiece & Filter Kit 1.25"
Aluminum Carrying Case  This sturdy and well-built case fits all of the above items in the die-cut foam interior and has room for additional accessories. I bought this kit with my first telescope to add to the standard eyepieces that it came with. It does exactly as described...it adds various focal length eyepieces that are different to standard lengths that come with most telescopes. The barlow is a great addition, essentially doubling the amount of eyepieces you have. The filters are very good quality, metal cased and individually cased for protection. The eyepieces feel and look better quality than the ones you can buy seperately, the 32mm is by far my favourite. It's chunky and very well made, bringing excellent views of clusters very sharp to the edge of the view. The case is nice and sturdy, the contents are set in foam cutouts and will not move about inside. There's plenty of room inside to cut foam out to fit any other eyepieces and filters you might have. This kit works out cheaper than buying the items seperate and although I've upgraded from the plossl design, I still keep this kit and go back to it regularly.